If Google Chrome is the most used browser, other publishers are gravitating in the hope of grabbing a few crumbs. This is the case with Opera, a software with a complicated history and whose choices have not always pleased users. Indeed, while the browser had many qualities, the company that publishes it decided in 2013 to change the rendering engine to the Chromium one. As a result, many features have disappeared, in pain for some users. Since then, Opera has recovered colors and tools. Let's see what this browser has to offer us. The installation of Opera is fast and does not require many clicks. 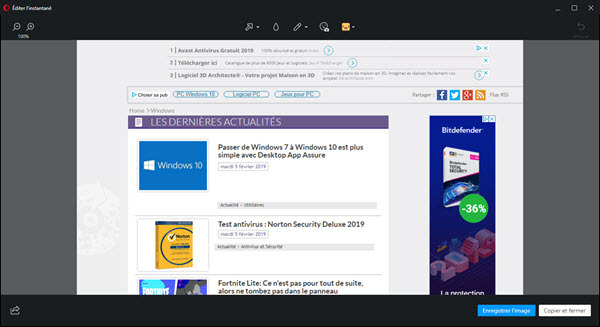 Two things to note anyway: Opera gives itself the right to become your default browser even on Windows 10 and the software will also retrieve all your favorites from your main browser. This can be prevented by clicking on the "options" button in the first installation window. When the browser opens for the first time, two things can be noticed: the home page is composed of a series of tiles that will evolve according to the sites you will visit. Then, we can see on the left a vertical toolbar that we will have the opportunity to detail later. Finally, the rest of the options are hidden in the button at the top left, featuring the Opera icon. By default, the proposed search engine is Google and you have to go snooping through the browser settings to be able to change for DuckDuckGo, Bing or Yahoo! 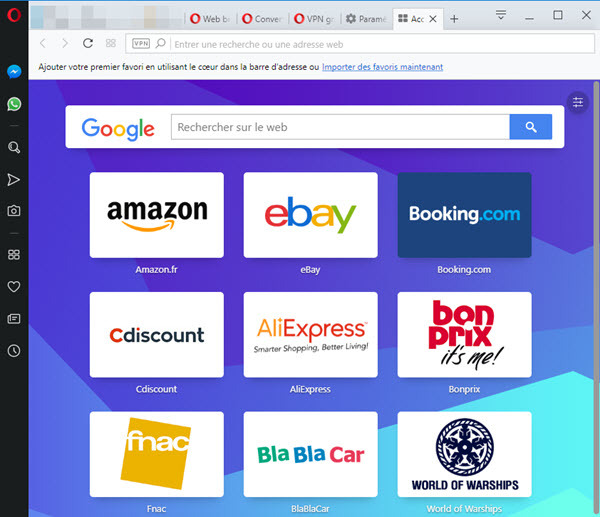 The Opera home page can be customized: choice of a theme, a wallpaper, display of favorites and even a list of news... Opera has definitely thought of this page as a melting pot of information that the user can keep on hand. But why use Opera instead of Google Chrome for example? The navigator has many assets to promote. As mentioned above, Opera has a toolbar available at all times. There are accesses for Messenger and WhatsApp: after you have logged in, you have access to your conversations and continue to chat with your family and friends. There is also an instant search bar, access to "My Flow" to send pages from your computer to your smartphone (if you also have Opera on your smartphone) and a button to take screenshots easily. This last feature even offers a small editor to annotate, blur and add emojis. Finally, the last four icons provide access to the quick access page, favorites, news and navigation history. 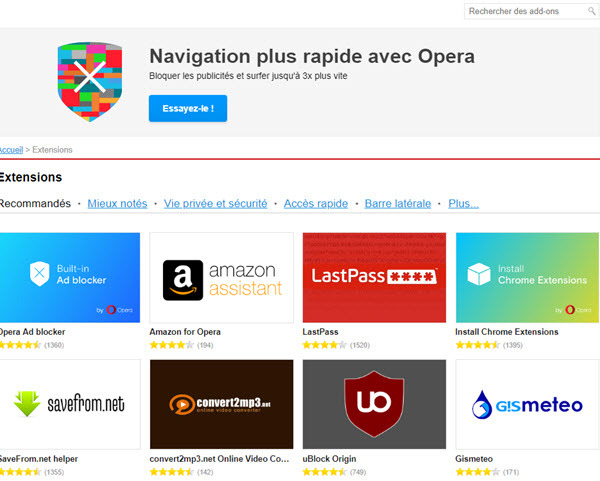 Opera also includes its own ad blocker and a homemade VPN. The latter is accessible on the left of the search bar (after activation in the options) and allows you to choose between several destinations. It is available free and unlimited, which is not insignificant if this type of solution is used regularly. Opera also has its own currency converter: if you are on a site that displays prices in dollars, simply highlight it to see the correspondence in euros. This tool also works with measurements, distances and time zones. Finally, Opera is known to have a much better battery life than its competitors. 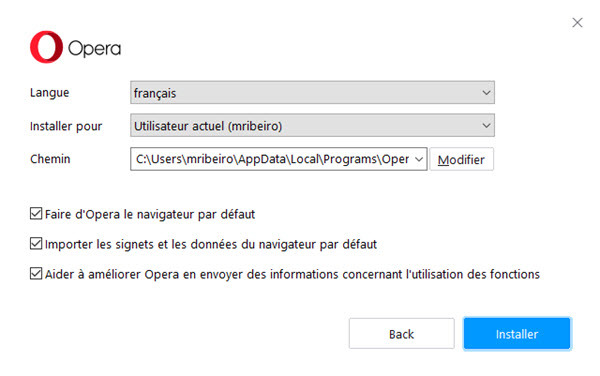 To do this, the editor offers a function called Opera Turbo that compresses the data so that it is less demanding on the computer. Opera has its own extension store which is quite provided with editors who develop add-ons especially for the browser. 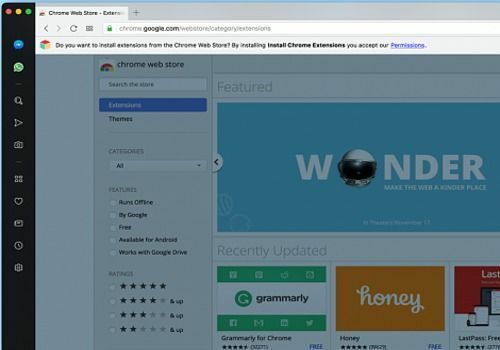 But as it is based on Chromium, Opera is also compatible with all extensions available on the Chrome Web Store. The choice is therefore very wide and Opera is as good as Google in the variety of extensions available. Opera has come a long way: the switch to Chromium had stripped it of all its features but the browser has managed to get back on track. In use, the browser is fluid and the various tools offered are well integrated. Native access to a VPN or screenshot module is a good idea and the quick access page can really be customized according to your desires and needs. All these are good points that could well make you abandon your current browser if you take the time to try Opera and discover all the features that await you.